Today I have nothing to rant about *shocker*. I am actually quite content with how things are going which is a first for me as I am easily ticked off by the smallest thing. The summer weather in Australia is breeding the worse kind of bug. For those of you in the northern Hemisphere; I am want to be in the snow storm because of one bug and one bug only. DAMN blow flies. Not just your standard blow fly. Like 1cm, fat, loud and buzzing blow flies. I have the worse luck with these kinds of bugs because for some unfortunate reason they are attracted to me. You know some people get bug “love” bites at night? Well it is same relationship (forgive me for a lack of a better word) I have with flies. I almost got into an accident because of one of these flies. I am not a big fan using air conditioning in the car. As a driver, I am aware about the fuel/power consumption that comes with blasting the AC in the car, and anyway I can save a bit on the petrol (always a good thing). So the other day while driving along a road I am completely familiar with; a fly would think it would be funny to buzz into the car and refuse to leave! Being the annoying bug that it is, it was targeting my ears and nose. Combine my aversion to these bugs, driving and a failure to think on my feet (should of just pulled over in hind sight); I just had to grin and bear for the last ten minutes of my trip. Prrfff…. it was a dangerous, shaky drive. But enough my problems and on to these cookies. One of key things with white chocolate cookies (in particular ones with cocoa free base) is that they are ALWAYS ridiculously sweet. 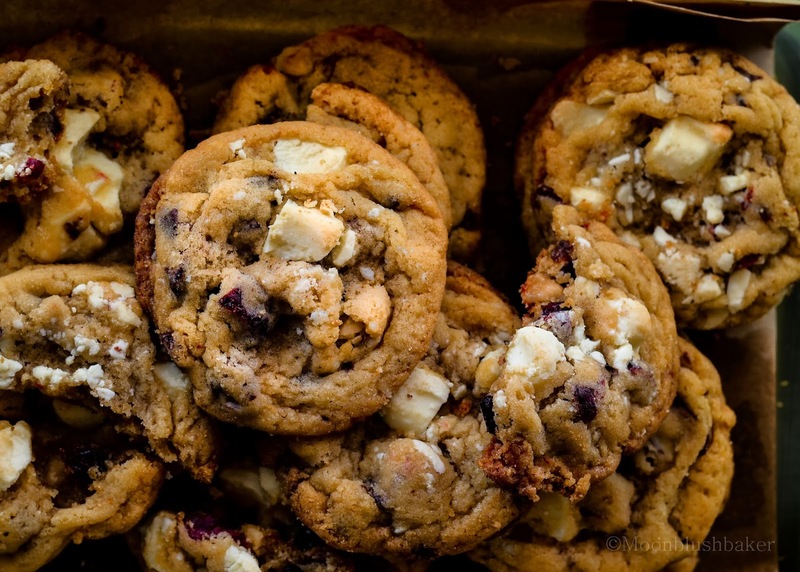 Sometimes cookies that feature white chocolate are like biting in to a cube of sugar (yuk!). So in an effort to help fix this problem. 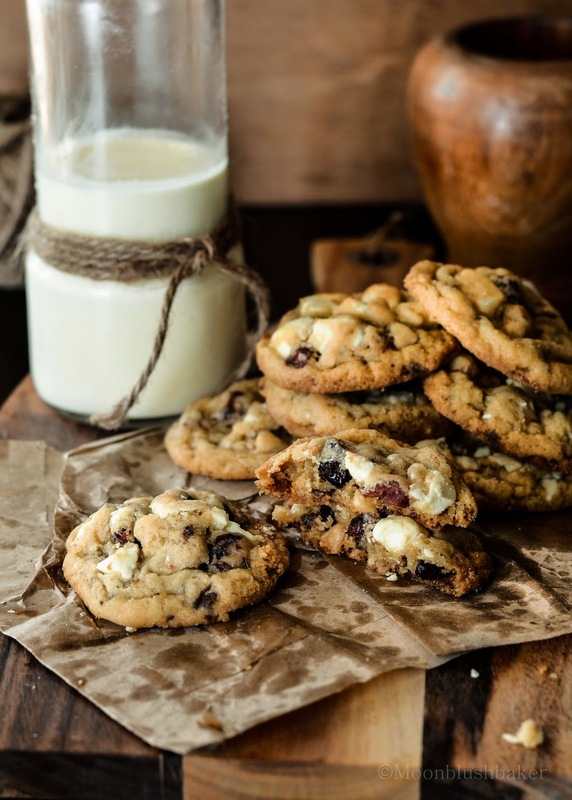 I have actually found a way to reduce the extra sugar in the cookie mix without effecting the chewy, soft texture that these cookies are so famous for. My secret? Use custard powder. If you look at the ingredient list in Custard powder; you will find it is just mixture of colours, flavour, corn starch and sugar. So by replacing some of the bread flour in these cookies with this sweet powder; it helps with the soft texture while sweetening it at the same time. Thus the need for additional sugar is not there! WIN! I have also included ground macadamia flour (ground nuts) in the flour mix as I am feeling a bit indulgent; but they are great without them. Simply use the same amount of plain flour in the mix. Yes these do require you to freeze them overnight but I assure you (as a cookie lover) freezing dough is the best way to help pastries relax and become flavorful. 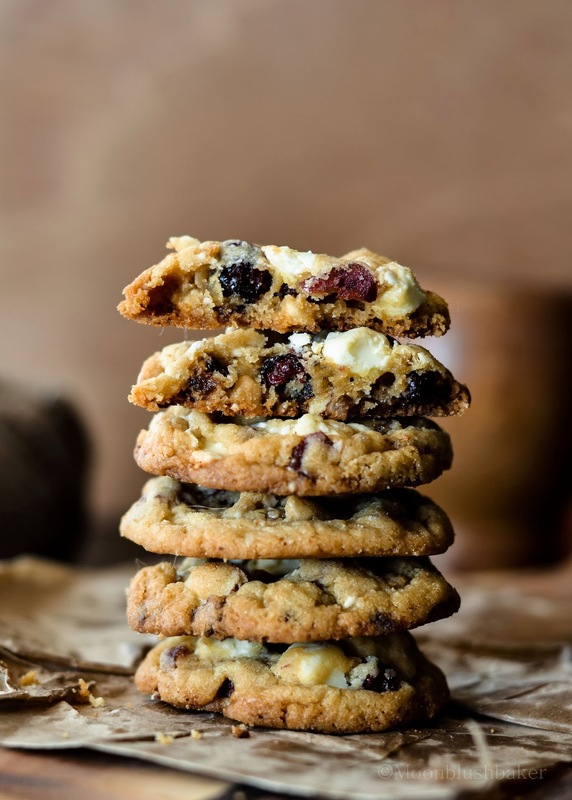 Once you bite into these cookies the tart sweetness from sun dried raspberries and cherries help to break that clawing sweetness from the white chocolate. I only placed half of the white chocolate chips in the batter as studding the top with MASSIVE pieces of chocolate is what cookies are all about right? 140g white chocolate, half chopped finely; half in 0.5cm chunks. In stand mixer cream the butter, sugar and egg for 5 minutes or until light and fluffy. Add vanilla and whisk for additional 2 minutes until it returns to it fluffy state. In another bowl combine your flours, nuts(or more plain flour), custard powder, baking soda and salt. Fold in the flour mixture into the butter mixture. Stir in your finely chopped white chocolate, cherries and raspberries. 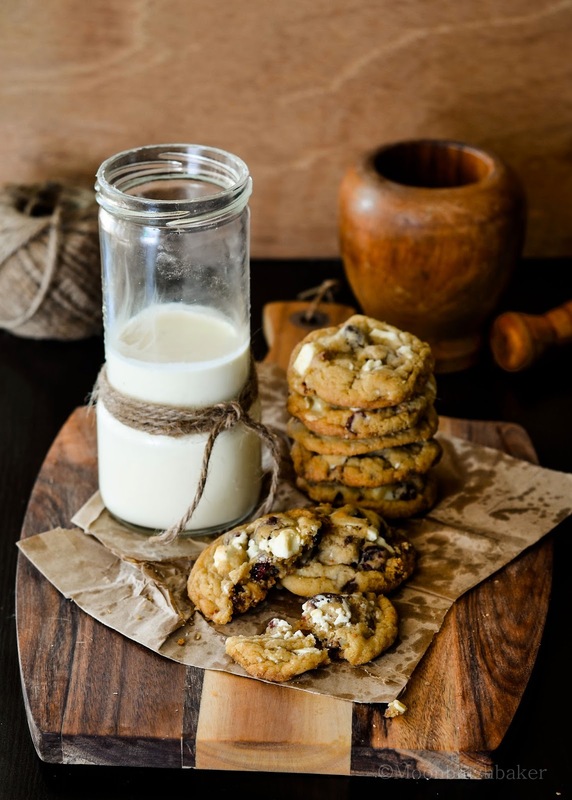 Using a cookie scoop or table spoon roll out rounds on to a cookie sheet lined with baking paper and fridge overnight. When ready to bake take out the tray 10 minutes before cooking. Preheat oven to 180C. Place each cookie ball 4 cm way from each other on a lined cookie sheet. Stud in your big chocolate chunks. Bake for 9-10 minutes until the edges are brown. Leave to cool on the tray then transfer to cookie tray to finish cooling. Store in air tight box. These cookies look so delicious. Wanting me to get up and make some! Thanks Rochelle! The best part is that they keep extremely well; chewy for days. Those look so so sooo incredible. I usually stick to the usual chocolate chip, but I need to branch out more! Definitely time for change Teffy; White chocolate may be frowned upon but pair it with tart fruits and it is really a taste experience. i love white chocolate, cherries and raspberries. yum! 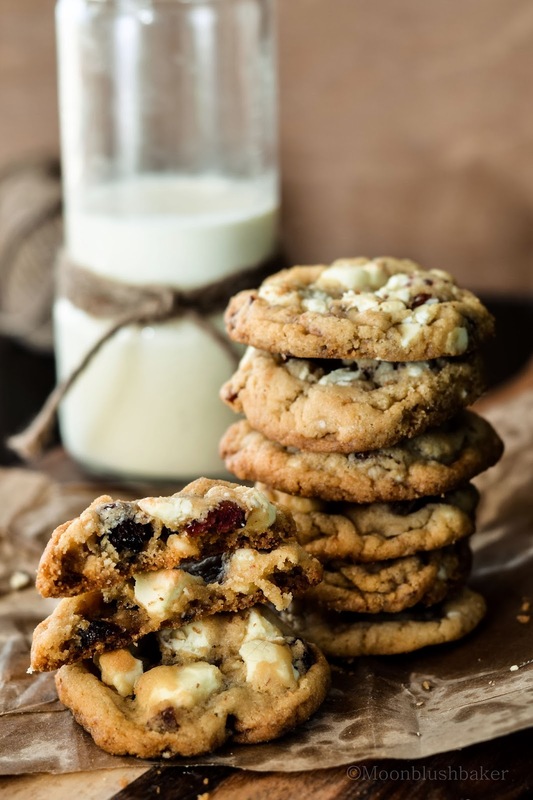 I never been a fan of white chocolate until I made these cookies. The cherries and berries really change it. Yuck, fliers are terrible, especially ones that bite. These cookies on the other hand are fantastic! I also often feel white chocolate deserts are too sweet. Ooh … these sound delicious for so many reasons … the ground nuts, custard powder, macademias, white choc … I know what you mean about the pesky flies. Flies are annoying but it’s the mozzies that really love me! 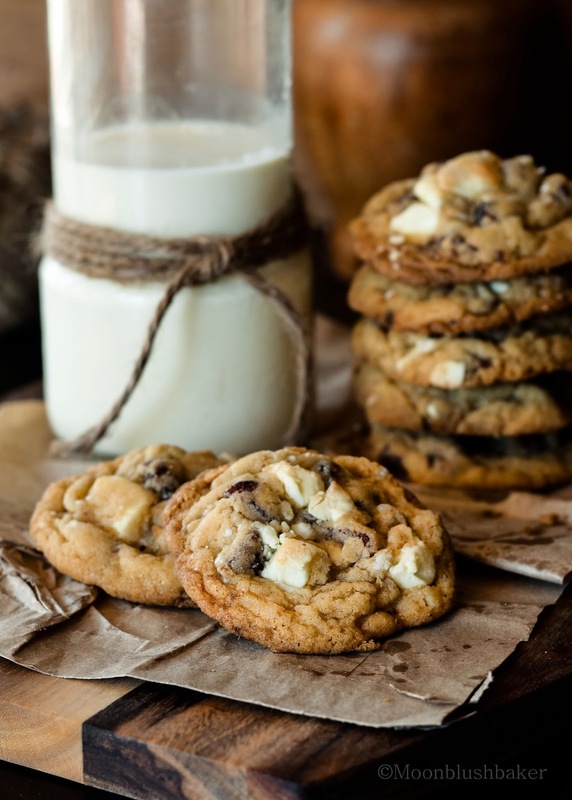 I love custard powder , it the best ingredient in these cookies. You are like my sister, she gets the worse mozzie bites; but I hope you are staying bite free this summer. I hope she loves them! Wish her a a happy birthday for me. 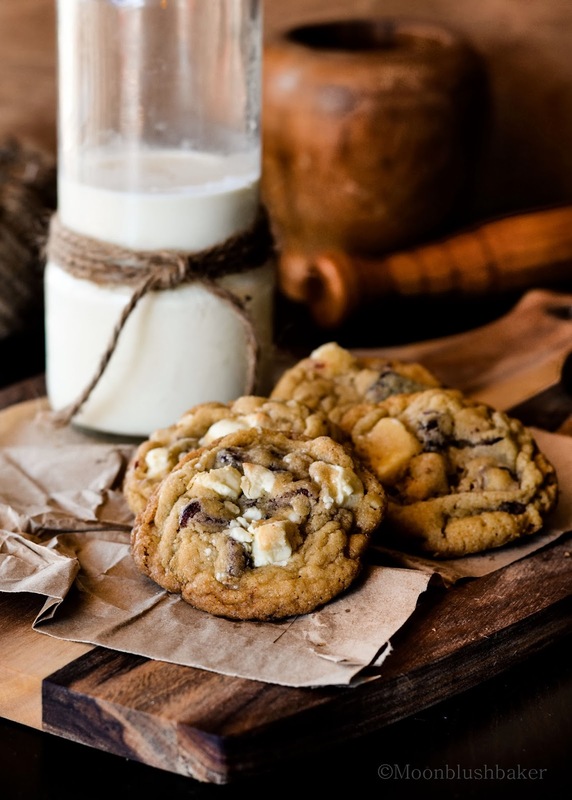 First, just by looking at the grease on the brown paper I KNOW these cookies are mah kinda thing. Second, custard powder rocks. Ppl should really chill out about artificial flavours that’s not gonna kill you and are already in everything. Third, my neck is all ticking and itching right now…. I hope not from bugs Mandy! But yes the grease is a thingt hat these cookies are famous for but that what them so delicious. Custard powder owns my heart. period.